According to the official Club bylaws, our purpose is to: (a) promote swing dancing and other forms of social dancing; (b) foster a warm, encouraging, and healthful environment for new dancers; (c) create and sustain a sense of community among all swing dancers, swing dance clubs, and swing dance organizations; and (d) encourage all interested members to become involved in the Club's activities and to seek elected and appointed offices in the Club. We especially want to encourage people who are new to swing dancing to become involved in the Club. Why was the Club started? When was the Club officially founded? In January 1989 (June 11th, 1989 1st Fundraiser Flyer), Marla Bach, Sherri Mertle, Steve Wong, and Rosemary Zachary invited all the dancers they knew to a meeting at Marla Bach's house to see if other people had an interest in forming a new swing dance club and to determine what people would expect from a club. Approximately 50 people attended that first meeting and the enthusiasm and interest were unbelievable. A second meeting was held a few weeks later at David Anderson's office at Oracle Corporation. Nominations were solicited and the first Board of Directors was elected. Then a vote was taken on a name for the Club. All the ideas from the first meeting were divided into five areas and groups were formed to further develop these ideas. These groups became the five initial standing committees. Each group chose a leader to represent them on the Board of Directors. These leaders became the first committee directors. Many names were suggested before the vote on a Club name was taken. "The Next Generation Swing Dance Club" was suggested by Steve Wong, an avid Star Trek fan. Steve got the idea from a conversation he had with one of the older swing dancers who told him she was glad to see that the next generation of swing dancers had come along to keep swing dancing alive. Yes. The Club is incorporated as a non-profit organization. Contributions to the Club are tax-deductible, including membership dues and other donations. Who runs the Club? The management of the Club and all its activities is done by volunteers. All Club members interested in sharing their time, talent, and ideas are encouraged to work as volunteers at Club dances and special events, become involved in the Club's committees, and run for elected positions on the Board of Directors. The Board of Directors oversees all of the Club's activities, including review and approval of the activities and budgets of the various Club committees. The board consists of five officers (President, Vice President, Treasurer, Secretary, and Membership Director), five independent directors, and seven committee directors. A new board takes office every year in April. All officers and independent directors are nominated and elected by the general membership; committee directors are appointed by their committees. To prevent any possible conflicts of interest, the Club bylaws do not permit professional dance instructors to serve as officers of the Club or directors of any Club committees, although they are allowed to serve as independent directors if elected by the members. All Club members are welcome to attend board meetings. Check the monthly calendar or call the Club President for details about date, time, and location. What are the responsibilities of the Club's standing committees? What is the purpose of the Club’s ad hoc committees? What is the Founders Committee? The four original founders of the Club (Marla Bach Saltzstine, Sherri Mertle, Steve Wong, and Rosemary Zachary) created the Founders Committee. The Committee also includes other Club members who have demonstrated an ongoing commitment to maintaining the Club's original purpose, philosophy and vision. According to the Club bylaws, the purpose of the Founders Committee is to assure that the Club does not stray from its original purpose, philosophy and vision. The Founder's Committee also conducts the annual election of the Board of Directors to avoid any potential conflict of interest among the current Board. How can Club members volunteer? Members can volunteer by talking to any board member (see the names printed in the newsletter and listed on our website), or by indicating their interest on the membership application. What is the New Member Welcome Dinner? Several times a year, new members who have joined the Club during the previous months are invited to a welcome dinner sponsored by the Club. This is an opportunity for new members to meet one another, meet veteran Club members, and learn more about the Club's activities. Why are the Club's monthly dances held at the Allegro Ballroom? When the Club was founded, the Dance Committee examined many potential locations for our monthly dance . The requirements were a large dance hall, a decent dance floor, plenty of free parking, a central location that was easily accessible from all over the Bay Area, and a moderate rental fee. After careful consideration, it was determined that the Irish Cultural Center in San Francisco met the Club's requirements. Over the years, Club dances were also held at the Oakland Masonic Center and the Metronome Ballroom. In January 2002, the Club moved to the Allegro Ballroom in Emeryville for our monthly Club dances . Why are the Club's dances held on the first Saturday of the month? From April 1989 to December 2000, our Club held dances on the first Sunday of the month, because there was a long tradition that Northern California swing dance clubs would take turns hosting Sunday evening dances. However, after much discussion and input from the members, the Club's Board decided to move our dance to the first Saturday of the month beginning in January 2001. The Club continues to hold dances on the first Saturday of every month, except when we move the date due to special events such as Boogie by the Bay (our Club's annual convention). Does the Club offer dance lessons? The Club along with the Allegro Ballroom holds a beginner/intermediate West Coast Swing lesson in a separate ballroom during our Club dance. The Club also sponsors workshops by out-of-town instructors at our annual convention in October. We are fortunate to have many fine swing dance teachers living in the Bay Area, including several national champions. Check our monthly calendar for a list of teachers and dance studios offering group classes and private lessons. Does the Club encourage other types of swing dancing? Yes. Although our members are primarily interested in West Coast Swing, the Club promotes all types of swing dancing. We have some members who dance Lindy Hop, Smooth Lindy, Balboa, East Coast Swing, St. Louis Shag, Carolina Shag, and other swing-related dances such as Shim Sham. What is Club Night Out? The purpose of Club Night Out is to promote West Coast Swing dancing around the Bay Area by encouraging Club members to try different venues including nightclubs, support new dance spots, celebrate special dance events and support other dance Clubs. What is Boogie by the Bay? Boogie by the Bay is the Club's annual swing dance convention held in October over Columbus Day weekend. Like other swing dance conventions, Boogie by the Bay consists of lots of social dancing, competitions, and workshops. Tickets are available every year beginning in May. Additional information, including a detailed schedule of events, is posted well in advance on our Web site at wwwboogiebythebay.org. What is a Luck of the Draw contest? Luck of the Draw is the generic name for a contest where dancers sign up as individuals rather than as couples. Partners are chosen randomly (such as rolling dice, picking cards, or drawing names out of a bucket), and couples must then demonstrate good social dance skills (timing, teamwork, and technique) as they dance to music selected in advance by the DJ, rather than execute a pre-choreographed routine to music of their own choosing. A Jack & Jill contest (men leading, women following) is the traditional format for this type of contest. The Jack & Jill contest was created by Jack Carey and has been a swing dance tradition for many years. Other (less common) formats include Jill & Jack (women leading, men following), Jack & Jack (men leading and following) and Jill & Jill (women leading and following). If a contest is called Luck of the Draw, that usually means that dancers of either gender may sign up to lead or follow. What is a Mixed Level Strictly Swing contest? Mixed Level Strictly Swing is where dancers sign up as couples, but advanced dancers must dance with either intermediate or novice, and intermediate dancers (at the discretion of the judges) may dance up or down. Originally, a jam occurred spontaneously whenever a crowd would gather around one or more couples showing off their hottest moves, often in a spirit of friendly competition. A jam may also be organized by an MC who will invite everyone to form a big circle to start the jam. Couples may take turns dancing, the MC may call on specific couples to dance, or one person may remain in the circle and dance with a rapid succession of partners (as in a birthday jam). Why go to swing dance conventions? Dance conventions are a great way to meet and dance with people from other parts of the country and experience different styles of swing dancing. Conventions attract top professional dancers as workshop instructors, competitors, and judges, so attendees have an opportunity to see, learn from, and even dance with the best. There are swing dance conventions all over the country, all year long. In addition to Boogie by the Bay, many of our members go to the Capital Swing Dancers convention (Sacramento) over Presidents' Day weekend in February, the Greater Phoenix Swing Dance Club convention (Phoenix) over the 4th of July weekend, and the U.S. Open Swing Dance Championships over Thanksgiving weekend. Some Club members go to many other conventions throughout the year as well. Check our monthly calendar or our website for a list of upcoming conventions, and ask veteran dancers for recommendations of worthwhile events. There can be some confusion about the name of our swing dance club. That's because it's nick-name, Next Gen, has become popular. It's easy to say and it's very current. However, the legal name of the club is The Next Generation Swing Dance Club. This is the official corporate name that appears in all legal and corporate documents including contracts, finanlcial papers including our checks, By Laws, membership forms, etc. The name, The Next Generation Swing Dance Club, was conceived by the original founders in 1989. It's a brilliant choice because it instills newness, renewal, and keeping current. But try saying it fast three times or typing it over and over. As such, you will often see use of the leading caps of the club's official name in print; TNGSDC. Interestingly, (and incorrectly) we sometimes see NGSDC. Not to get picky, but the word "The" is part of the organization's name. So the correct abbreviation is TNGSDC. Here's a little historical trivia about deciding on the name of the club. The original founders held a meeting of interested dancers to vote on the club's name. Fifty-two people showed up for that meeting! In the end, it came down to two possible names: The Next Generation Swing Dance Club or Rock n' Rhythm Swing Dance Club. The final vote was 27 to 25, in favor of The Next Generation Swing Dance Club. So in today's sound-bite, texting world, the club could have ended up informally being called "R&R" instead of "Next Gen". About 2007, we started using the Club's nick name, Next Gen, on some of the club's media such as the NewsMagazine and the website. Use of Next Gen had been used in the community for years and it was time to put a more current face on the club. In some ways, the market drove the Board's decision to adopt the nick name, Next Gen. It is easy to pronounce, easy to text, and has a more current feel to it. Adopting a corporate nick name isn't unique. A known local nick name was for Washington Mutual Savings Bank being called WAMU -- everywhere. The use of the nick name Next Gen is the same idea. 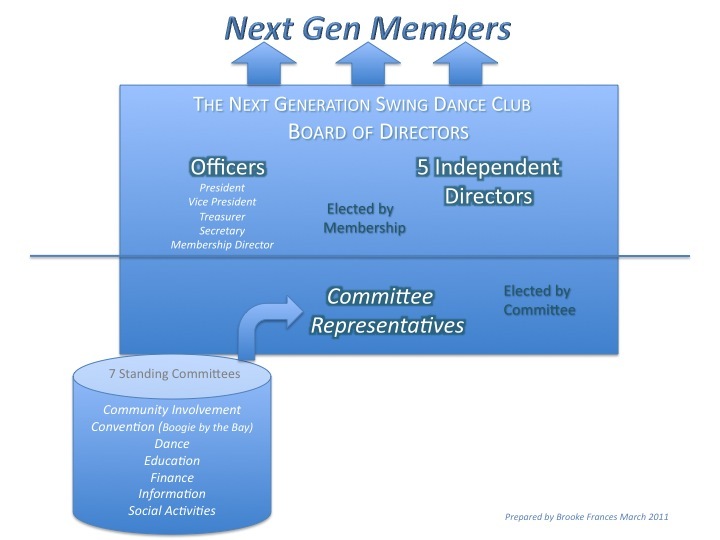 The corporation will always be named The Next Generation Swing Dance Club (TNGSDC). So now you're all in the know -- all you Next Gen members! West Coast Swing, the State Dance of California since 1989, is a form of swing dancing that evolved on the West Coast in the early 1940s from the Lindy Hop and Jitterbug of the 1920s and 1930s. Unlike other forms of swing dancing with circular patterns, West Coast Swing is danced in a linear slot, allowing a large number of dancers to pack a dance floor. The basic patterns (underarm pass, side pass, push break, whip, etc.) are 6 or 8 counts long, and there are hundreds of intermediate and advanced patterns and syncopations of various lengths, providing endless variety in an evening of dancing. Who Created West Coast Swing? Nobody knows for sure. Some claim the dance evolved by necessity in overcrowded California dance halls during World War II. Others credit Dean Collins for creating slot patterns to keep dancers within camera range. Dean was a legendary Lindy dancer who came to California in the late 1930s and choreographed most of the swing dancing performed in Hollywood movies during the next two decades. Some give at least partial credit to Laure Haile, who developed the first syllabus of steps for the Arthur Murray Studios in the mid-1940s based on what she saw the street dancers doing. Whatever its origins, the dance was known as "Sophisticated Swing" or "Western Swing" until the 1950s, when the dance was renamed "West Coast Swing" as a parallel to "East Coast Swing" and to distinguish it from Country-Western dancing. Check out more History of West Coast Swing and other Styles of Swing. Do people dance West Coast Swing in other places besides California? Yes. The popularity of West Coast Swing has sky-rocketed in the last 20 years! WCS is no longer popular just throughout the United States. Now damcers from all over Europe, Asia, South America, and, of course, Canada travel far and wide to learn and enjoy WCS. In Texas, Push (Dallas area) and Whip (Houston area) are regional forms of swing dancing that are very similar to West Coast Swing. Although the basic patterns have been around for a long time, the dance continues to evolve as new dance music appears and dancers join the West Coast Swing dance community from other dance backgrounds. Are there other swing clubs in Northern California besides the ones in the Bay Area? Yes. Four other swing clubs a bit farther from San Francisco are the Capital Swing Dancers in Sacramento, the Santa Cruz Swing Dance Club, the Redwood Empire Swing Dance Club in Santa Rosa, and the Biggest Little Swing Dance Club in Reno. Some of our members attend their dances, and some of their members come to ours. Some dancers belong to multiple clubs. In addition, there are several dance studios that feature West Coast Swing dancing throughout each week. Check our monthly calendar on this Web site for details about dances and other events sponsored by these clubs. And it's not just West Coast Swing -- Lindy classes and dances are offered throughout the San Francisco bay area. Go to lindylist.com or swingtalk.com to see what is going on at any given time.